We know just too many people, who travel to UAE and visit Dubai and Abu Dhabi only. These two cities are grand for sure, but do you really think that such country as UAE offers only these to its visitors? Guess again! Only 160 kilometers East from Abu Dhabi lays a city of Al Ain. Sure, it cannot be compared to Dubai or Abu Dhabi, but that does not mean it is not interesting to pay attention to it. We have visited Al Ain as a part of our roadtrip around UAE. We spent one whole day here and never regret it. Instead of tall new buildings, Al Ain city can finally offers some tradition and history. 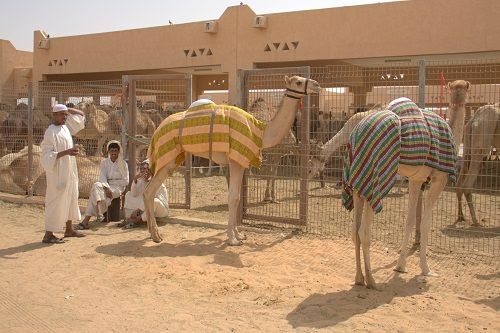 If you want to get a feel for local traditional Arab life, make sure to visit the camel market in Al Ain. Selling and buying camels has been a big thing in UAE for centuries. The camel market and all the fenced off areas are relatively new, but luckily they were built it in a traditional style, what looks much more appealing. The best time to visit this camel market is early in the morning, when the most determined buyers come. Watch them how they carefully check each camel, just to make sure what they are buying. Of course the purchase cannot be done without a long and loud bargain among the seller and buyer. It sounds like an argument, but it is all a part of their tradition and daily life. If you are asking yourself, what all the fuss about the camels is, you might be surprise that a simple baby camel costs from 1200-1300 EUR. Adults are twice as expensive – and we only talk about camels, which are being breed for milk and meat. The camels for racing are worth a fortune. This can show us, that someone with a large herd of camels is not just a poor farmer, but a very rich in fact. During your visit to the camel market, sellers will often ask you to take photo with their camels and if you except, make sure to prepare some change, as it will not be for free. Bargain well! The camel market opens at 7am and closes at 1pm. Al Ain city has got his present look around 1970. 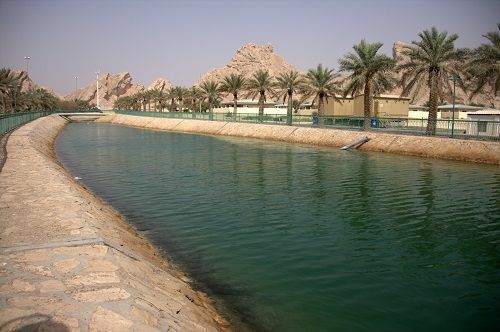 Before that, Al Ain was nothing more than few small villages around water springs. Its development started because of Sheikh Zayed, the first president of UAE. He was born in Al Ain and wanted some development for his birth place. Sheikh Zayed had built four lane roads, roundabouts, parks, shopping malls. Luckily, not all was transformed and we can still see two beautiful oases here. One of them is Al Qattara. 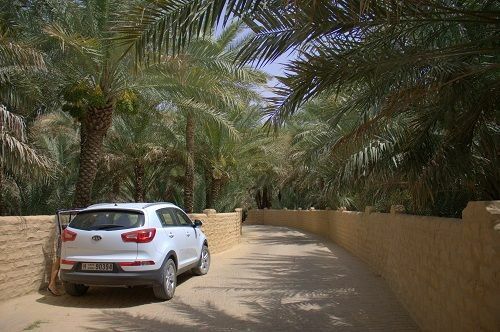 A walk or drive through Al Qattara oasis shows that oases are still very important for locals. If there was not for the oases, people would not be able to grow fruit and vegetables here. 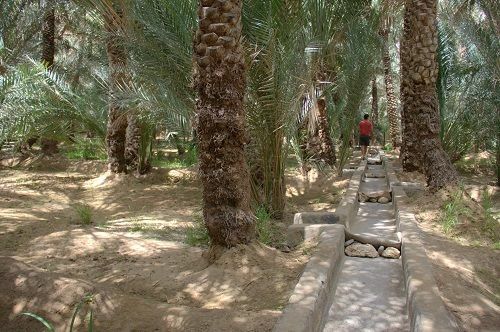 Al Ain was once the biggest producer of date fruits in the country and there are still countless date palms here now. 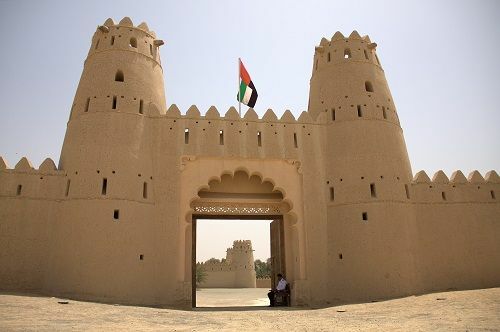 Some tourist attractions in UAE are completely free of charge, including forts. 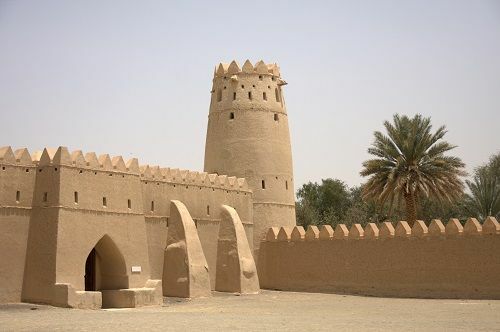 Unfortunately UAE has not many renovated forts to visit (much more can be seen in Oman), but that only means if you see one, stop and visit it. One of the most beautiful forts in the country is Al Jahili fort in Al Ain. It was built by Sheikh Zayed in 1898. If you are not into forts, you might want to stop here to see the photo exhibition of British explorer and traveler – Sir Wilfred Thesiger. He was the first one crossing the Empty Quarter desert. Its book »Arabian Sands« is known as the classis travel literature. A little bit outside of Al Ain lies Hafeet Mountain (1348 meters). There is a silky smooth asphalt road to the viewing point at the top. 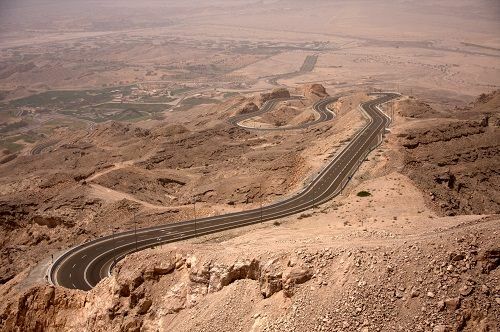 The road is known as the best and most spectacular road in UAE, some even say it is the best in the world. It truly is amazing and 60 hairpin bends make it even more spectacular. Owning a motor bike and driving up, you might think you are in paradise. There are lots of cyclists training here as well. Just watch out for some local drivers, who think they are on a race track. Reaching the top, you will find a bar, a restaurant and a playground for children. If you have a clear blue sky, you’ll have gorgeous views all over Al Ain and surroundings. Unfortunately we had a windy day and the sky was not clear due to lots of sand in the sky. Visiting the Green Mubazzarah will show you, how important water in a desert is. 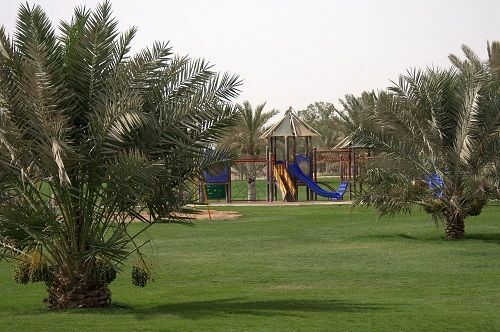 The green area is one of the most popular areas for picnics among locals. There are playgrounds, a kids train and some hot water springs, where you can bathe in – separate areas for men and women. In vicinity is an artificial dam, which offers small boats for rent. At the time we were there, everything looked closed. Very close by to Green Mubazzarah is also a historical Mubazzarah dam, but it was completely dry in May, when we were there. I guess if we’d visited UAE somewhere from December to March, the views should be a little bit more attractive. 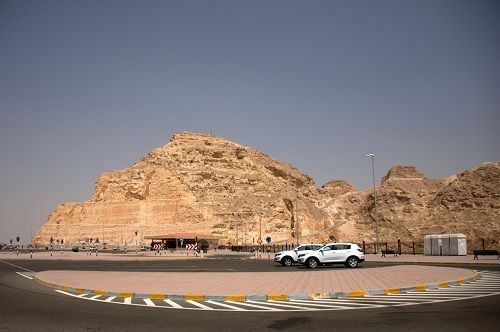 Traveling to UAE is definitely worthwhile – even more, if you join Al Ain tourist attractions with attractions in two most popular cities (Dubai and Abu Dhabi). You cannot get the whole picture if you don’t make the effort to explore other areas as well. Believe us, you will be surprised, what all is here to see and do.